Thanks to: Paul Giaccone (AGS forum) for the help with slang. Maniac Mansion Mania is a fangame series created by fans of Maniac Mansion that revives and expands this historic video game. 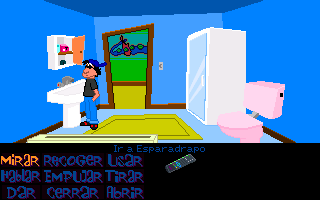 The series has an episodic structure, so that each developer can contribute with his own story to the Maniac Mansion universe. 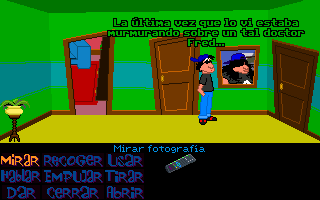 Maniac Apartment is the second "international" Maniac Mansion Mania episode, after 'Britney's Escape'. This episode, in fact, was born as a "stand-alone" fangame too before becoming part of the MMM series. Reuben is Hoagie's cousin, and is late for work. He's in a hurry, but he's locked in his own house! 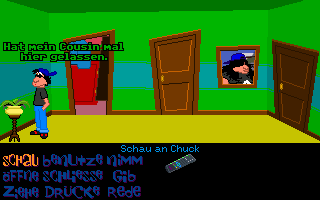 'Maniac Apartment - Hoagie's Cousin' originally was born as a stand-alone fangame, outside the German community, under the name of Maniac Apartment. Some time ago the MIWF (Italy) released a revised version of it (see the spoiler at the end of the post), including a few fixes. 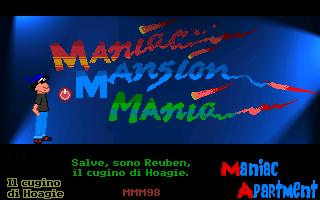 Today, thanks to the collaboration between the author (Slovenia), the MIWF (Italy) and the MMM forum (Germany) the game can be included in the Maniac Mansion Mania continuity. two characters, Reuben and his sister Candy, are introduced in the MMM series; both of them are Hoagie's cousins! 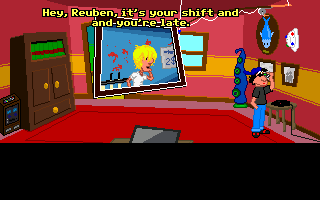 Reuben and Candy are in Day of the Tentacle style graphics! ... in addition, there are a couple of easter eggs (one of them really difficult to find)! The game can be downloaded here, while the source can be found here. With the consent of the author, and thanks to the support of the MMM host, MIWF Italia makes the game source code available and freely usable, so that anyone can make any improvements where deemed necessary. Any new versions of the episode will be hosted on the MMM forum. The graphics of characters and locations are also available, to be freely used for future episodes by other authors. Advices, questions and opinions, for improvements or anything else, should be discussed on MMM forum or MIWF forum, in case additional information are needed. 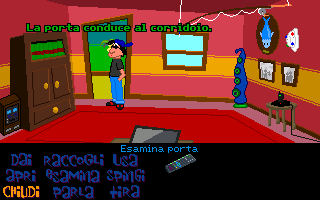 This game includes the italian translation of dialogues, GUI and graphics, as well as the correction of some bugs, and the update to AGS 3.3.4. Many thanks to: Arena80 forum for hosting the game. After Maniac Mansion, here's to you Maniac Apartment! 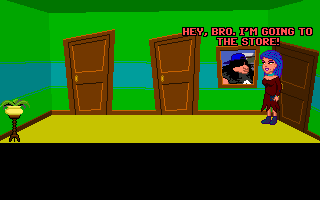 The main character of this fangame is the cousin of Hoagie, one of the protagonists of "Day of the Tentacle". We find him struggling with some kind of "domestic" trouble. What about helping him out? If you have problems playing the game in fullscreen mode, try choosing directdraw 9 + max filter in winsetup.exe. Otherwise, you can try try different settings for Graphic Driver and Graphic Filter (the best combination should be "DirectDraw5 and Max Nearest-neghbour Filter", but you can try others based on your PC); moreover, you must uncheck "Side borders on widescreen monitors"
At this link you can find the translation thread, for requests, questions and comments. Thank you all for the enthusiasm with which you support us: it gives us the right spirit and thus allows us to continue to pursue these fantastic projects! Also, a big THANK YOU to Arena80 forum for giving us permission to host our work on their web space. Good day to all, boys and girls! The international cooperation between the various forums is working GREAT! Thank to Cireja, from the Spanish forum of AbandonSocios, now this game has also his SPANISH LANGUAGE VERSION! We from the Monkey Island World Forum are delighted by these collaborations! The link to download the new release is the same! Now awarded with Maniac Mansion Mania Seal of Approval! Congratulations, it always puts a smile on my face when I see a new Maniac Mansion Mania episode. And when I saw this two years ago, I remember thinking to myself that it would fit in perfectly as a Maniac Mansion Mania episode. It's nice to know it became one.